In this BBC story, Bayer is said to have made a takeover bid for Monsanto. The deal, should it happen, would create the world’s largest seed & pesticide supplier. Bayer is the second-largest crop chemical producer behind Syngenta. Monsanto tried unsuccessfully to purchase Syngenta in 2015, with Syngenta accepting an offer from ChemChina (the deal is still under review). See Bayer CEO video here. A good read from a scientist/founder of a biotech company that believes GMO foods are safe AND thinks they should be identified on food packaging: Jason Kelly is a founder of a biotechnology company that makes products with genetically modified organisms for the food industry and he believes that food labeling is a good idea. 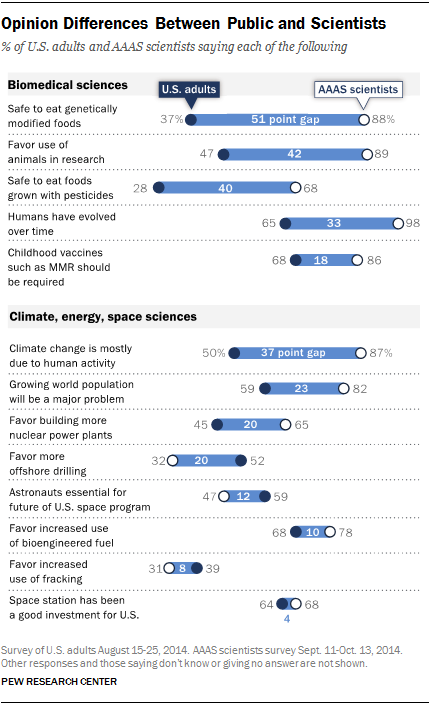 He sides with 88% of his colleagues in thinking that modified foods are safe (see graphic below), although that number is much lower in the general public.